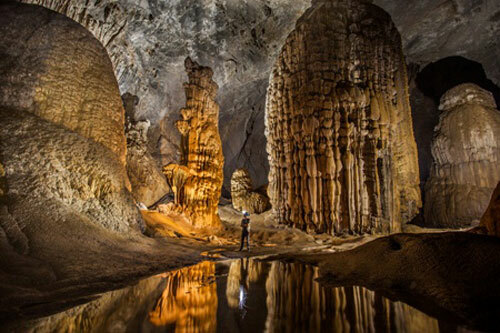 Son Doong Cave in Viet Nam’s Quang Binh Province has been suggested by the American news website huffingtonpost.com as one of the places to visit in 20 years. In an article entitled This Is Where You’ll Go On Vacation In 20 Years, the site mentions the cave – the biggest in the world – alongside 14 other places on the globe. Son Doong was discovered by chance by a local man in 1991 and first explored by some British cavers in 2009. The cave is more than 200m wide, 150m high, and approximately 9km long. It also has a jungle and a river, and could fit a 40-storey skyscraper within its walls. It was classified as the largest cave in the world by the British Cave Research Association and selected as one of the most beautiful in the world by BBC news. Other places that have been mentioned in the article include the massive Ferris wheel and river pool in New York, Mount Everest in Nepal, the Grand Canyon Escalade in Arizona, an underwater city and the world’s biggest mall in Dubai. A volcanic magma chamber in Iceland, mail tunnels and Europe’s biggest indoor water park in London, Koh Rong Island in Cambodia and a completed Sagrada Familia in Spain, have also been suggested. Earlier, Son Doong had also been listed in the “52 Places to Go in 2014” by The New York Times Travel.